Okay, so you’ve gotten through a few patterns and are ready to tackle a big pattern. Feeling overwhelmed yet? Well, don’t! These aren’t technically any more difficult that stitching anything you’ve already stitched. Just more time consuming. I do have a few tips for you that will make things go by more smoothly, though. 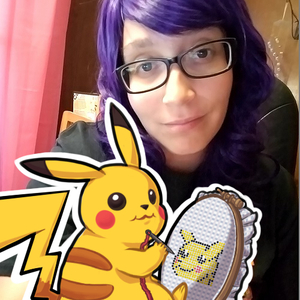 online, or a photo you ran through a cross stitch program yourself, you’ve got a something that will provide you the size of your design, and the colors you’ll be working with. Your first decision will need to be what kind of fabric you’ll be using. 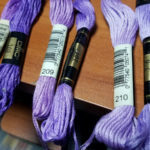 As was discussed in a previous tutorial, there are many different count sizes, colors, and textures to cross stitch fabric. You might want to do it on 14 or 18 count to keep it large for a big epic framing. Or you might pick something like 28 count so you can get away with only doing half stitches and still get full coverage. 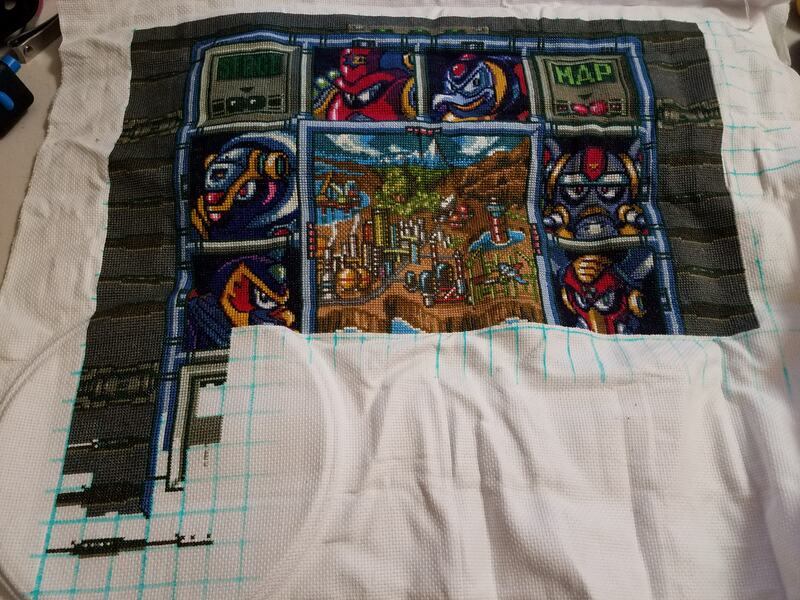 Whatever you decide, you’ll most likely have to order online in order to get fabric big enough to fit a large project. There are many places that allow you to order full bolts of aida. And most specialty stitch stores will have fabric available by the yard. Whatever you decide, make sure you do the math. Double, and triple check to make sure you have enough room for your project. 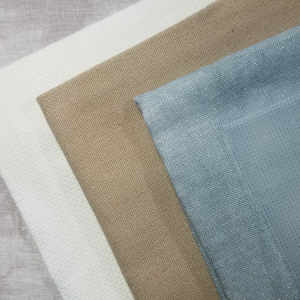 You’ll want to also leave a 3″+ border around your project for future framing, and to account for fraying fabric. Side Note: If you’re doing a full coverage piece, the color of your fabric won’t matter. By full coverage I mean a pattern that will be a full big block of stitches with no gaps. All that fabric will be covered, and you’ll likely be framing pretty close to the edge, so the actual fabric likely won’t be seen. 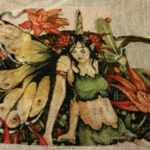 If you’re doing a large piece that does have a lot of background such as a Mirabilia design, you want to pick a complementary color that won’t detract from the design, or even a gorgeous hand-dyed fabric. It’s also very important that you pick up all of your thread in advance. Some designers will give you a stitch count, or estimate how many skeins of floss you might need of a color. If they don’t, it’s best to order extra. 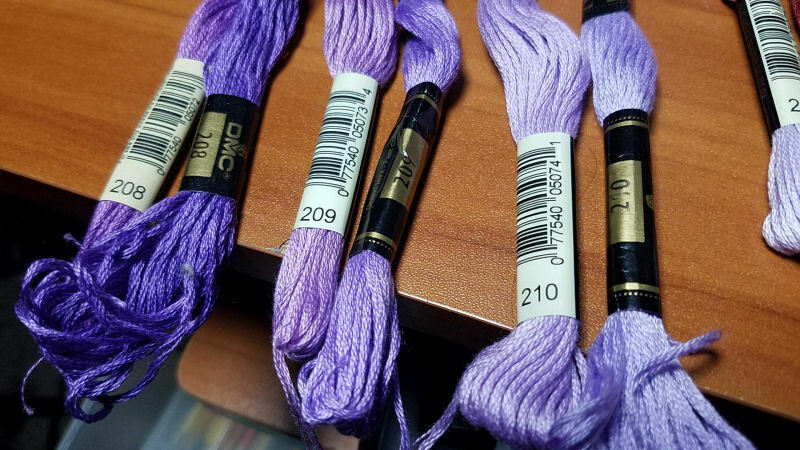 DMC and all other thread brands occasionally have to change dye lots. It doesn’t happen all that often but since these big projects can take years to complete, there’s a chance that when you run out of a color and go to pick up more, it will be a slightly different shade. Fraying. Before you start, you may also want to prepare the fabric. You’ll likely be working on this a long time, so fraying is inevitable. To help prevent that, there’s a few options you can try. If you have a sewing machine, you could sew a zigzag stitch around the borders of your fabric. You could use a product like fray check which will stiffen the edges and keep them from fraying. Or, you could use masking or painter’s tape to tape all along the edges. This last method leaves a sticky residue, and you’ll often want to cut it off when you’re done and ready to frame. So, you may want to leave an extra inch border around your project if you use this method. Gridding. The other thing you may want to do to prepare is gridding your fabric. This is not necessary, but helpful for many if you want to avoid miscounting and having to undo progress. It also helps you make sure that you do in fact have enough fabric. Basically, you’ll be marking 10×10 grids on your fabric that you can easily follow along on your pattern. As with most things, there’s many different methods to this. 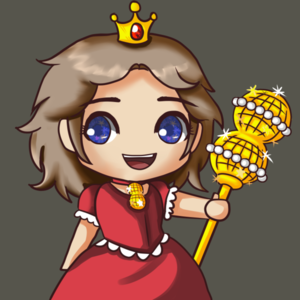 There is such a thing as pre-gridded aida called “Magic Guide” aida. In the US, I’ve only seen it online, in 14 count, and no larger than 14″ by 18″. 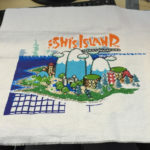 But I was able to find some more varieties at SewAndSo (UK) Basically, the you just wash the fabric and the grid fades away when you’re done stitching. If you want something easier to find in stores, there’s fabric pens that wash out as well. (see image on left) You could choose to draw out the full square like Jennuh did, or you could simply do a small + at the corners where squares meet. 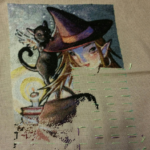 Another method is by stitching in a grid using a thread of a color that stands out. In the example to the left, Jennuh has used fishing line to carefully grid the project. 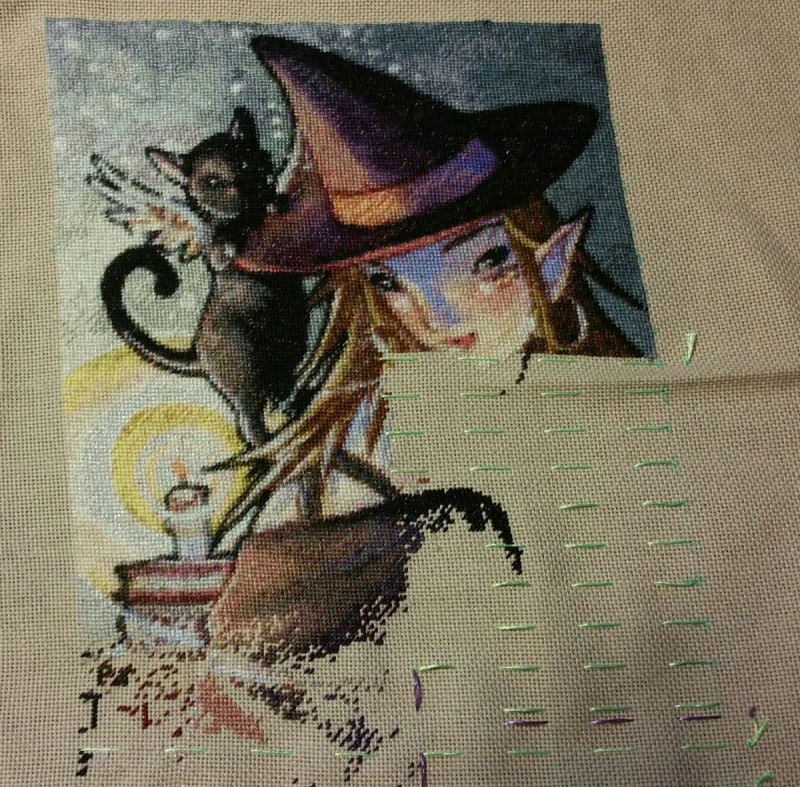 This can be easily pulled out once she’s done stitching. Again, you could carefully outline every square, or take some shortcuts as needed. In the example to the right, I only stitch the horizontal lines and just alternate 10 above and 10 below. The purple silk was the borders of pages, while the green was just the normal grid. Finally you’re all set up and are ready to start stitching. Or are you? A few more decisions need to be made. First of all, are you starting in the center? For big projects most people start in the upper left. Or upper right, if you’re left handed. This is because most large patterns come with several pages. Trying to figure out where the center of a multi-page pattern can be daunting at best, so it’s easier to just start on page one. Just start wherever you’re comfortable, though. 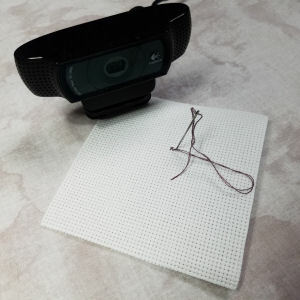 Are you going to stitch in hand? Use a hoop? 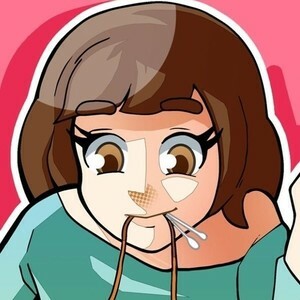 Q-snap? Set up a scroll frame? This is all a matter of personal preference really. But all the extra fabric that extra fabric comes with makes it awkward to stitch using your normal methods. Plus, you’ll want to keep tension even throughout, or that perfect square pattern can end up being more of a parallelogram. I personally prefer using a Q-snap as they’re inexpensive and don’t leave ugly ring marks on the fabric. You can also get Q-snap or Hoop cozies that keep the frame clean, and also provide a place to tuck in some of that extra fabric. 😉 Scroll frames don’t leave marks, but can be a bit more of an investment. It can be worth it if you want to stitch using both hands, though. Lastly, how are you going to tackle the stitching? There’s a few different methods of stitching big projects, but it’s not really unlike stitching a normal project. Like everything else this is all a matter of personal preference, and you won’t really know until you try. 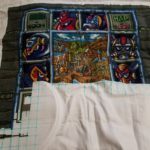 I’m not going to go too deep into these methods, as there are many resources online about these, but I just want to make sure you’re aware of the different stitching styles. Parking. If you’ve researched big projects already, you’ve probably come across this method. There’s several variations to this and it’s hard to explain without really showing you each one, but the basic idea is that you stitch a row or section at a time, and just leave your thread at the next stitch. In the example to the left, I was stitching one 10-stitch tall row at a time. 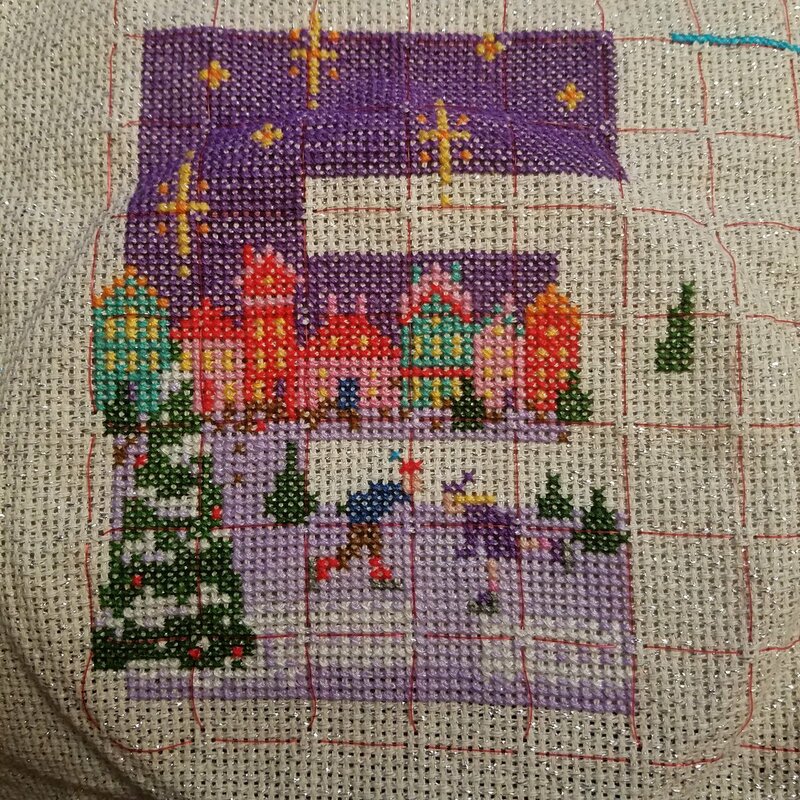 I’d pick a color, stitch all of that color in the row, and then leave the thread dangling at the next stitch of that color in the following row. I’d work one row left to right, then the next right to left. I do not recommend working 10×10 rows, as you’ll see it leaves grooves in the fabric showing. These may not be as visible if I ever wash and iron it. (I’d have to actually finish it for that), but it can still be discouraging. In my second attempt at parking, I started being a little more random in my stitching. Following clumps of a color to their completion and just parking the thread after that clump ends. You’ll see in the image to the right that this keeps those grooves from forming and looks a lot more natural. There’s still notable grooves where pages ended, however. If you look around online you’ll find lots of parking methods. Some stitch in a diagonal, some do some sort of zig-zag pattern along the edges of a page, etc. Some even leave the color threaded and just have a collection of needles tucked into the fabric nearby for when they’re next needed! I recommend searching for parking methods on YouTube, as it’s a lot easier to demonstrate these methods than to put it in writing. Cross Country. This second method is something you may already do in smaller projects. 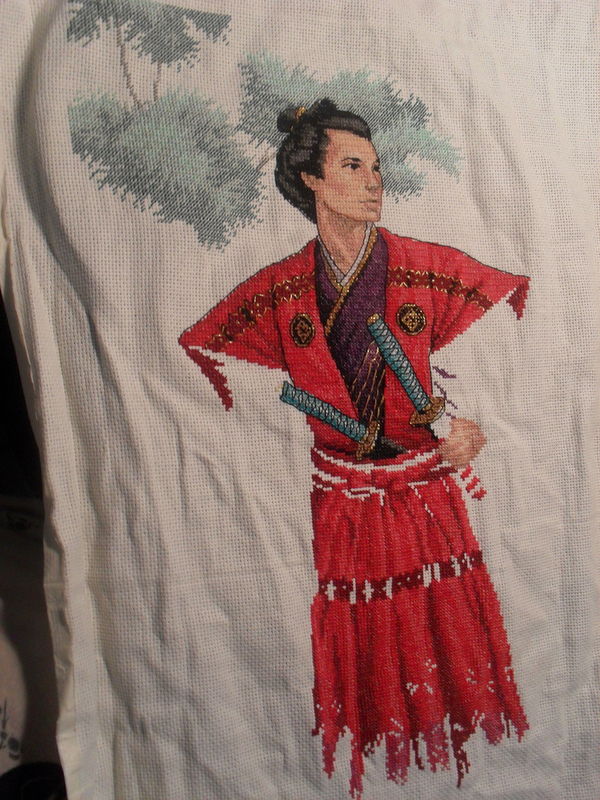 Quite simply, it means doing ALL the stitches of a single color before moving on to the next. 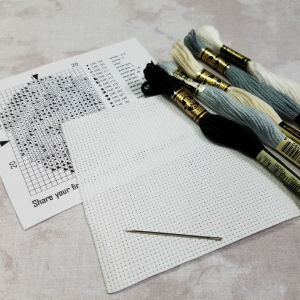 Most people who use this method start with whichever color has the most stitches, as that will form the foundation of your project and all the others can be counted off of that one. This is typically a dark, or shadow color. However you may also choose to start with the smallest color and start eliminating colors early to keep up motivation. If that first color doesn’t span your entire project in easy jumps, you’ll probably want to grid your fabric. On the left you’ll see an example of this. 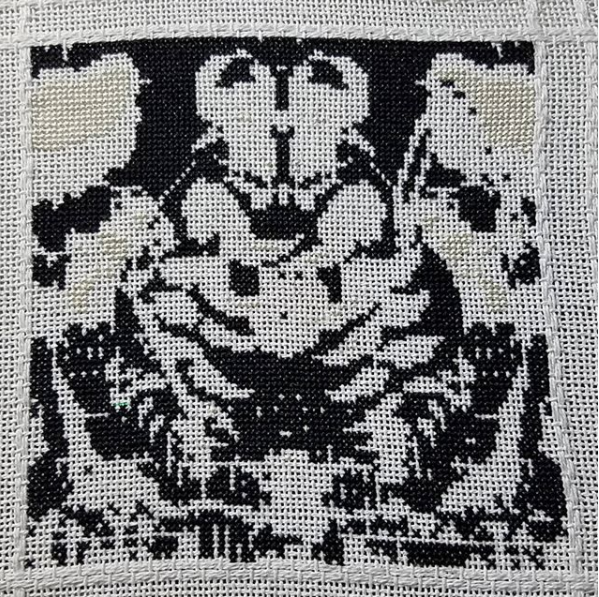 I started my Secret of Evermore quilt square by stitching all of the black first. (and the white, in this photo) This made for a stark outline and made it easier for me to fill in the rest of the colors. Another good example of this is hapaddict on Instagram, who is working on a huuuuge Arrow project, one color at a time. She’s been saving the largest colors for last, however. Chaos. Okay, that’s not technically the name of a method. But it’s what I do. There might be a name for it, I don’t know. But basically I start in the upper left corner. I look for the largest chunk of color in that section. I thread my needle with that color and then stitch until either that thread ends, or the next stitch is 5+ stitches away. Then I pick another color. It could be back up near the upper left, where I left off, or somewhere along the way. But simply whatever color draws my fancy and is adjacent to something I’ve already stitched. In the end I’ve found it to be the most enjoyable for me, as it keeps me from getting too bored with a project, and easier to break up the monotony of one large color. One more thing I want to talk about. Motivation. It happens with smaller projects too, of course. 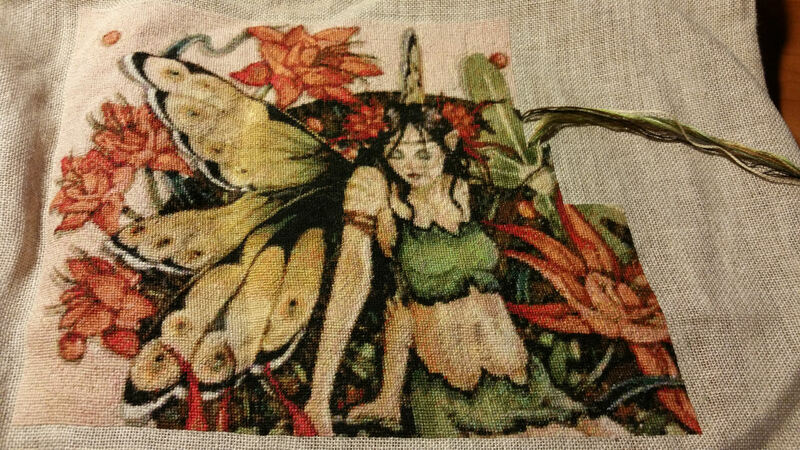 But the hardest part of a large project is not the stitching itself, but the time investment. By their very nature, progress seems slower. You’re actually going at your usual rate, but compared to the overall scope of the project, it seems smaller. It’s important to do things to help keep your motivation up and remind you why you started this endeavor to begin with. Small victories – Since you won’t get that rush of excitement that comes with finishing a project for a while, it’s recommended to set small goals. Whether it be a page finish, completing a color, or some other arbitrary goal, those little victories can help keep morale up and remind you that you /are/ making progress. Boring bits – Most large projects have their ‘boring’ parts. 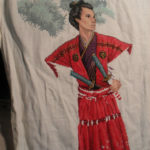 Especially full coverage stitches, which may have large blocks of background colors. I would recommend setting a goal of completing a certain amount of the dull areas and ‘rewarding’ yourself by skipping over to an exciting/fun part of the pattern, such as a face. 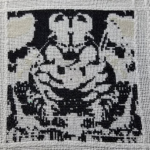 For example, EmzOLV has ‘motivational squares’ stitched into the sea of 797 in her pattern. She’d work on other parts of the pattern and every so often would stitch just a few squares. If you’ve gridded your fabric, this should be really easy to pull off. 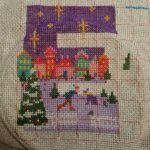 Share your progress – In this day and age we have all sorts of social media you can share your WIP shots on. It can be incredibly motivating to see those likes on your photos and comments congratulating you for how much progress you’ve made since the last. It may also benefit you to follow others working on large projects as well. Seeing the strides they’re taking and how other’s projects are developing can also inspire you to work on your own. Other projects – Unless you’ve some amazing focus, you’re likely going to want to take some time out for other projects. I find it helpful to interrupt large projects with a few small trinkets, or a medium sized project just to break up the monotony. Those finishes will boost morale and often get you excited to work on your large project again. Others start multiple huge projects and just have a ‘rotation’ where they’ll work on 1 for a week/month/whatever, then move on to the next. Whatever you do, just keep working away at that project. Whether it takes months or years, you’ll one day have a finished project to be proud of. Sirithre wrote this article. 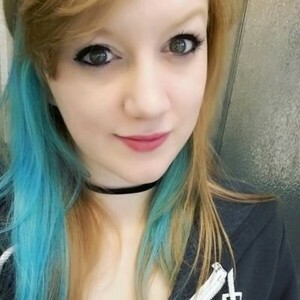 She is a participant in the Amazon Services LLC Associates Program, an affiliate advertising program designed to provide a means for her to earn fees by linking to Amazon.com and affiliated sites.